Liverpool are looking for their next manager after sacking Brendan Rodgers following Sunday's 1-1 draw with Everton. The club's owners intend to have a new manager in place for the Premier League trip to Tottenham on 17 October. 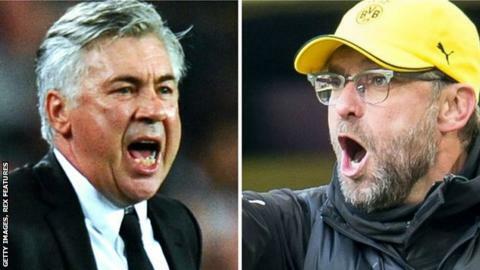 Former Chelsea and Real Madrid boss Carlo Ancelotti and ex-Borussia Dortmund manager Jurgen Klopp - both of whom are out of work - are the leading contenders to replace Rodgers. Meanwhile, Ajax manager Frank de Boer is another to have been linked with the Liverpool job in recent weeks. Here, BBC Sport examines who could take over at Anfield. The floppy hair, the stubble, the designer frames. You could say Klopp was eccentric, but that would only be telling the half of it. An imposing presence on the touchline - he is 6ft 4in tall - 'Kloppo' has won admirers across the game through his wit, charisma and good humour. On the pitch his Borussia Dortmund team were consistently a neutral's favourite - for reasons Klopp probably put best when was asked to compare his own team to Arsene Wenger's Arsenal. "Wenger likes having the ball, playing football, passes, it's like an orchestra. But it's a silent song, yeah? I like heavy metal," he said. "Fighting football is what I like. What we say in German is English football. A rainy day, a heavy pitch, everybody is dirty in the face and they go home and can't play football for the next four weeks. This is Borussia." What about his last job? Klopp won two league titles, one German Cup and made the Champions League final in 2013 in what he called "seven intense and emotional years" at Dortmund. One of the high points came when Real Madrid were thrashed 4-1 in a Champions League semi-final first leg in 2013, a victory Klopp said was "like Robin Hood taking from the rich". Last year, though, was a bit of a disaster. Having spent much of the campaign in the relegation zone, Klopp decided in April that his time was up and announced he would leave at the end of the season. His side rallied to finish seventh and reach the German Cup final, setting up what might have been a fairytale farewell in his final match in charge. Instead, though, it was a 3-1 defeat by Wolfsburg. BBC Sport's Ben Smith: "Klopp is highly regarded by Liverpool's owners and is the leading candidate to succeed Brendan Rodgers. "He was contacted by Liverpool three years ago before Rodgers's appointment, but at the time the German indicated that he had no intention of abandoning Dortmund, a club he would take to the 2013 Champions League final. "Although no formal contact has yet been made, it is my understanding that he has made it known he would be interested in taking over at Anfield if an agreement can be reached. "One source tells me that he has indicated, through intermediaries, that he would also be willing to work with a transfer committee and not take charge of transfers. "Liverpool will make an approach and he is seen as the ideal candidate for the post. Klopp has always made it known that he would be attracted by a project, rather than a ready-made giant. Liverpool would appear to fit the bill." The man, the Champions League pedigree, the eyebrow. Former Chelsea manager Ancelotti will be well known among Liverpool fans. The Italian has won Europe's most prestigious club competition three times, twice with AC Milan and once with Real Madrid, his last club. His time in English football was brief - the 56-year-old was sacked just two hours after the Blues' final game of his second season - but lives long in the memory. The quizzical drift that sent one eyebrow skywards was just the surface sign of a decency and humour under pressure that, maybe, would have brought greater reward with more time at Chelsea and Real. At both clubs he was sacked quickly when good results turned bad, and at both clubs he remains a popular figure. There are very few managers with greater European pedigree, but Ancelotti failed on the domestic front in his two seasons at Real. Despite leading the club to their 10th European Cup in 2014, he was fired at the end of last season, with Barcelona winning the Spanish league and cup before taking the Champions League too. He was given a standing ovation from the media in his final news conference at Madrid - an act that was repeated by Real's fans in his last match at the Bernabeu. BBC Sport's Ben Smith: "A fortnight ago, I was told that Ancelotti was sounded out by agents acting for Liverpool - or claiming to - but the Anfield club denied those reports in the strongest possible terms. "On Sunday night, the early indications were that Ancelotti was distancing himself from the post as he continues to recover from minor back surgery. "And yet it is understood that Ancelotti has a soft spot for the Anfield club ever since his Roma side played them in the 1984 European Cup final, a game the Italian missed through injury. "A proven winner, the Italian would demand big wages but where he goes, success follows." Former Netherlands defender De Boer won the Dutch league title four times in a row between 2010 and 2014 with Ajax, finishing second behind PSV last season. Speaking to the BBC World Service on Thursday, the 45-year-old said he would be interested in working in the Premier League at some point in his career, describing Liverpool as a "fantastic club". BBC Sport's Ben Smith: "De Boer will come under consideration. His ability to bring through young players is attractive and although he has won the Dutch league in all but one of his seasons since taking charge of Ajax, his lack of experience elsewhere may count against him." Dutchman Koeman signed a three-year deal when he took over at Southampton in 2014 and led the club to a seventh-placed finish in the Premier League last season. The 52-year-old has dismissed speculation linking him to taking over Netherlands, who are struggling to qualify for Euro 2016. Mazzarri has been without a club since his sacking by Inter Milan last November but the Italian remains high in the bookmakers' odds. The 54-year-old has also previously managed Sampdoria and Napoli, with whom he won the 2012 Coppa Italia.